Last week for my ‘Food on Fridays’ column I cooked a vegetarian tart with, courgette, sweet corn, spinach and tomato, in puff pastry. It was delicious and the best part, it was ready in less than half an hour. I also mention why sometimes tinned fruit and veg, are sometimes better than what we consider as fresh alternatives. Oh, and for dessert the simplest fruit tarts you will ever see. I hope you try cooking them and enjoy them. This week’s recipe may not be a diet-friendly one, but it is so simple that it will take you no time to prepare it. 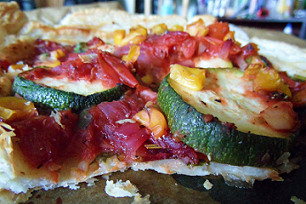 It is Puff pastry Courgette tarts. I know that pastry is high in calories, but it’s not as if you eat it every day is it? In fact I will cook a summer pie for this column soon. Besides we are making it with lots of veggies and you do not need to eat it all at once, this recipe should last you 3 servings or at least two. By the way we are also using tinned sweetcorn. Why? You may say. Well because corn is out of season at the moment so the ones that are in the super markets are, really over priced, and also from a country far, far away. Once sweetcorn is cut from the plant it does not continue to ripe and it loses its nutrients quite quickly. In contrast, tomatoes and courgettes continue to ripe even after they are cut, and they can last for ages, if stored properly. Tinned fruit and vegetables are packed when they are ripe and in season that is why sometimes they are better than their ‘fresh’ counterparts. Also it is better for the environment to consume seasonal produce. For dessert we are making, yes you guessed it, more tarts, I’m making them with apple and mango, but you can use any fruit that you fancy really. These are very simple as they do not have glaze over them and are baked for a small time to preserve the nutrients of the fruits. However if you prefer them more juicy, you could smother them with honey or jam. As usual, try to experiment and adapt this recipe to your own liking. Have a sunny weekend and don’t forget to change the clocks forward on Sunday. Cut the pastry in the middle, and lay it on a non-stick baking tray. Fold the outside edges in, as shown in the picture. You can always add another layer of pastry to the edges to make it taller. Then start by covering the pastry with the spinach, add some sauce and sweetcorn and then slices of courgette. Finally add more sauce and sprinkle it with more sweet corn. You could also mix in slices of raw tomatoes. Bake for about 10 to 12 minutes and serve with salad or more spinach. For the fruit pastries, use the remaining half of the pastry, cut it in any shape that you like, and add a crust to it either by folding in the edges or by putting in an extra layer. Slice any fruit you like and lay it on the middle of the pastry, dust it with the sugar and the cinnamon and if you are using honey now is the time to pour it all over. Bake them for 10 minutes or until they look golden. If you want to be very naughty serve these with ice cream.